It has been six months since Cailean’s death, and Elowyn can’t get his special clifftop in the mountains out of her thoughts…or her dreams. Something is drawing her there, despite the danger, and time is running out. The new spring growth is threatening to cover what’s left of his foot trail forever, but getting there is going to be more challenging than she imagined, especially with the thieves still lurking along the mining road. Morganne is having difficulties of her own. The monks are making plans to send the tomes away, Braeden’s tax demands are increasing yet again, and Morganne’s once prosperous shop has been noticeably empty. On top of that, the Kinship is getting ready to leave Minhaven—seemingly for good this time. With political unrest building, and the Black Shrine still intact, Glak and Bane want the girls to go with them. 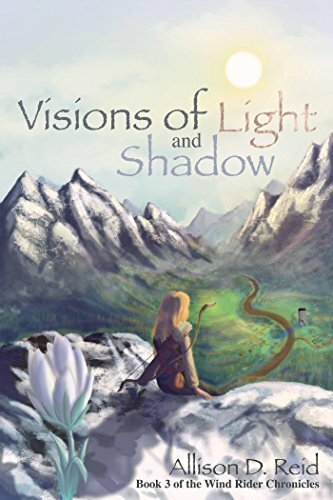 Elowyn is eager to leave her sorrows behind, certain that Aviad is calling them to follow the road beyond Minhaven, but Morganne isn’t so sure. She’s not ready to abandon everything they know for an uncertain future, and Elowyn finds herself at a crossroads. Will she be able to convince Morganne that it’s Aviad’s voice she is hearing, or will she be forced to go on alone? Six months have passed, and Elowyn can’t get Cailean’s special clifftop in the mountains out of her thoughts…or her dreams. Something is drawing her there, despite the danger, and time is running out. Morganne is having difficulties of her own. The monks are planning to send the tomes away, her once-prosperous shop has been noticeably empty, and the Kinship is getting ready to leave Minhaven—seemingly for good this time. Elowyn is eager to leave her sorrows behind, certain that Aviad is calling them to follow the road beyond Minhaven, but Morganne isn’t so sure. Will Elowyn be able to convince Morganne that it’s Aviad’s voice she’s hearing, or will she be forced to go on alone into an uncertain future? Morganne and Elowyn’s future in Minhaven has never looked so bleak. Thieves continue to stalk the miners, political unrest is increasing, and Morganne’s shop has been noticeably empty. The Kinship is leaving, too. Glak wants the girls to come along, but Morganne isn’t ready to abandon the life she knows. Will Elowyn be able to convince her that Aviad has been calling them to follow the road beyond Minhaven, or will she be forced to go on alone?